Australia�s most popular residential drainage system now has an extended product offering. Australia’s most popular residential drainage system now has an extended product offering. The ACO ShowerDrain range now comprises channels and floor drains which complement each other for use in a wide range of bathroom designs. These systems, designed for residential wet areas, comprise a wide choice of compact drainage systems designed for optimum performance, aesthetics and safety. 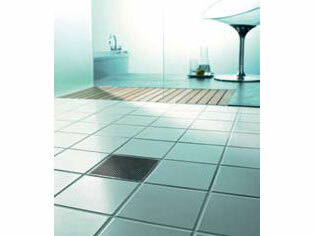 ACO ShowerDrain comes complete with the industry’s broadest selection of highly aesthetic, foot friendly grates. New to the range is ShowerDrain Gully, floor waste point drainage systems, complete with grates specifically designed to complement the ShowerDrain Channel range. Manufactured from 100%, stainless steel and available in 150mm x 150mm, 200mm x 200mm (Tile Insert grate only) or built to custom requirements, ShowerDrain Gully can easily be secured into the topping screed, ideal for existing (retrofit) or new bathrooms; and is generally installed in the middle of the shower area; or as an overflow relief gully within the bathroom. Seven grate options are available including Linéaire, a unique patented Australian made grate designed with anti-slip features to ensure surfaces are safe to walk on when wet, ideal for floor areas requiring enhanced slip resistance.